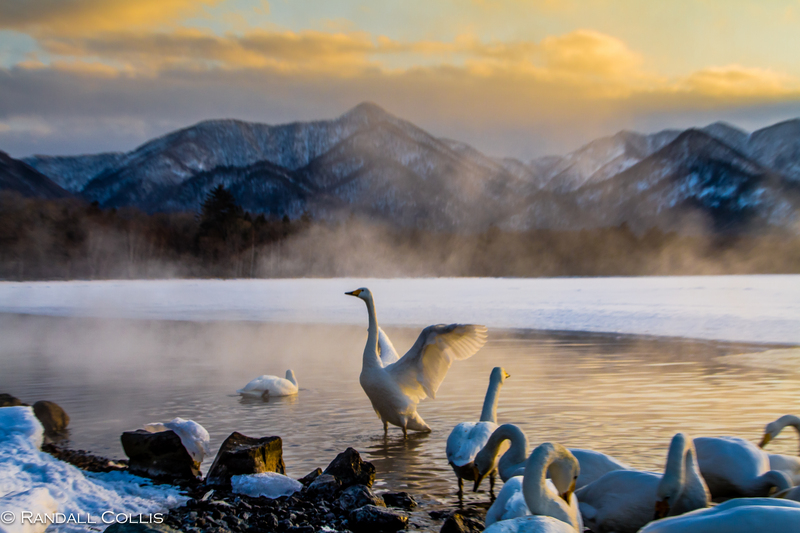 These photos are breathtaking, but I am not envious of your weather conditions. I feel like such a wimp for complaining about our “cold” weather. Thanks Beka, I too prefer warmer weather but every now and then I love what winter can bring. Cheers. Thanks Vance, always nice to have a little white in winter. That last photo is really cool! Here in The Netherlands it feels like it’s spring. I miss the snow. Thanks, it was a kick shooting in the blizzard. Wouldn’t mind a bit of the Netherlands spring right now. Wonderful post Randall, I loved it (as, I hope, did the girl with the laughing eyes). Almost (but definitely not quite) makes me yearn for a blizzard – but we don’t have those down here, which is a major reason that I moved here in the first place! 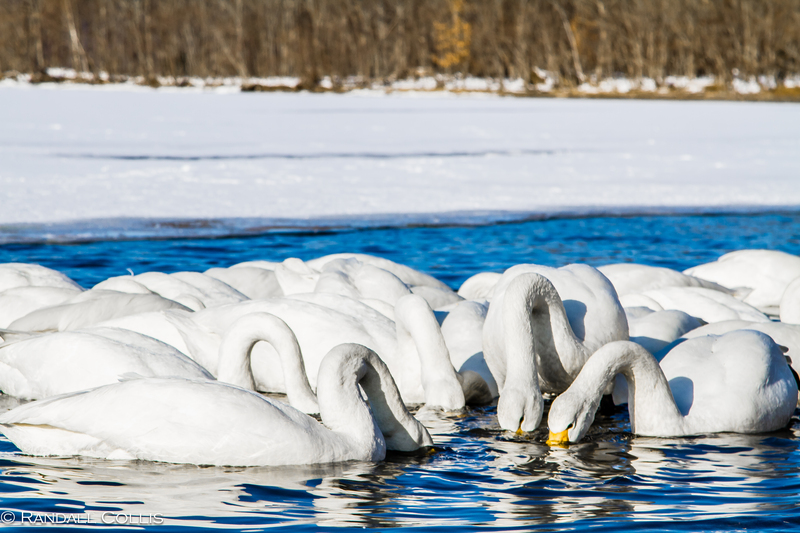 Love the Whooper swans but my favorite is your final shot of John. Thank you Tina, I feel the same. Being in a blizzard is a great experience to have…but I’d rather have sunshine 🙂 The photo of John is the perfect reminder of the fun that can be had in a storm. Cheers! These are swooningly beautiful, Randall. I confess that I am a lover of winter but it does tend to overstay its welcome. I think the changing of the seasons gives us a lot of beauty to go looking for. A reason to leave the house! I’m with you Karen, winter is incredible…but come February, I’m ready for spring. Changing of the season always creates a little more excitement. Thank you. Thank you…I really like how the last photo worked for you. It is one of my favorite shots. Cheers! Holy Cow..Wonderful photos. Randy your really good at this…..I find myself looking for your next post. Keep them coming. Hope all is well. My money is on the Hawks….I hope they make it happen. The City will go wild if they can pull it off. Cheers. I think that is very true Mabel, there is a dark and broody part in me as well and winter is the perfect time to let it come out. The excitement of new seasons always gets me up…I love the change of seasons. However, with both summer and winter, I get tired of them about halfway through and get a little impatient. In a way, you seem to outdo yourself with each post. In your words and spectacular photos, I find myself reflecting on attitude, perspective and intention. Such focus is invigorating. Thanks for creating the space in which to pause and Happy Chinese New Year, Randall. February is the perfect month to reflect… Thanks for the kind words; it is invigorating to combine photography with writing. It is an exercise that allows me a bit to pause and reflect (much like your posts and work). Look forward to a great ’14. I have to agree with Eric, Randall… These shots are stunning — way beyond stunning, actually — and I love the thoughts you shared. Although you know that I would actually LOVE some winter weather right now, I realize that too much of it can get old quickly. It really is about perspective and intention — all of life is. Thank you for the reminder today. By the way, how were you out with John Shaw? And you’re back in Seattle? You really *are* a world traveler! It is funny that with both summer and winter, halfway through each season I am ready for a change (spring and fall simply rule…). Yes, back in Seattle now ~ hope to be here for a couple of months. My frustration is that we haven’t really had a winter here. It feels like spring right now, and while other people are already begging for spring and summer, I am dreading them. That is… Unless we see a very unexpected change in weather soon, *or* I move to the Bay Area, where the summers are a lot cooler. We’ll see. So glad you’re back in Seattle for a while. Looking forward to more of your amazing pics of the city and surrounding area! Hopefully you will get some rain…I always root for a wet February for all the west coast. SF/Bay area would be perfect, one of my favorite places in the world. 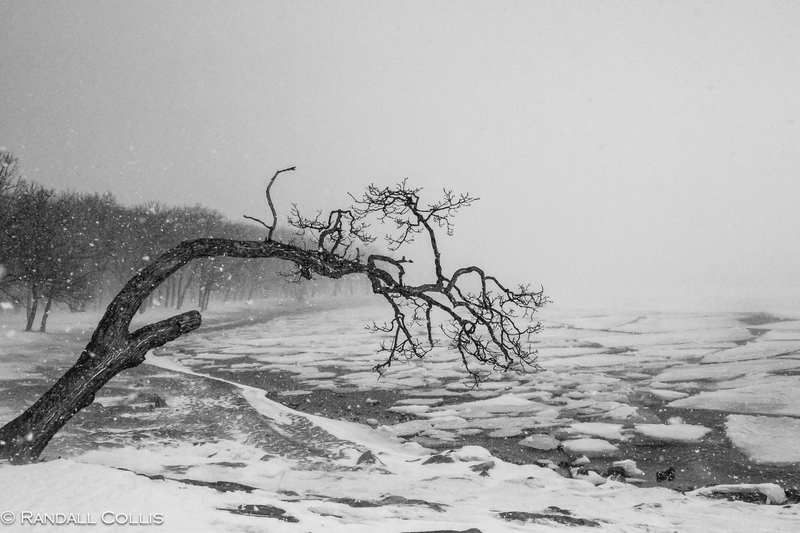 Stunning collection of photographs Randall! 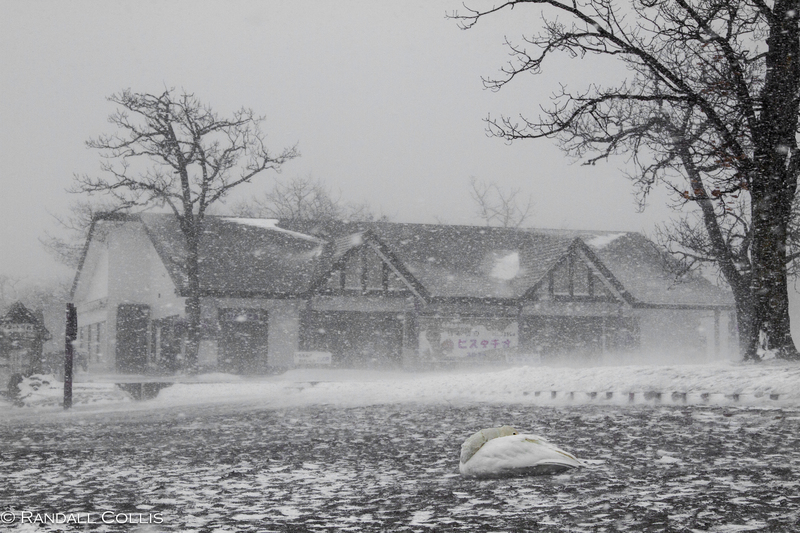 Thanks Chillbrook…nothing like a little turn in weather to create some nice photo ops, as you well know. Saskatchewan in winter…now that would be an incredible place to be: ice fog from the river valley, say no more. The cold/white/frost is what I love about winter. Extreme weather does excite me (blizzard, typhoons, thunderstorms), and I know it has the complete opposite affect on people (and for good reason), so I always have to temper my excitement at those moments. Thank you for your comments. Randall, these photos are magnificent. You truly do capture beauty in a blizzard. Love your words in between, your story. Truly quality post. Just beautiful. Thank you Noeleen, one of the best things I like about photography is the creation of stories & thoughts I have while shooting. A little bit of an escape from the world, which I think you understand that can happen when writing. Wish you well. These photographs are simply beautiful! I love every frame here, but my absolute favorite is the last one. Anyone so driven to brave the elements, just to do what he loves,is proof the soul and body human is extraordinarily made 🙂 . Thanks Dotta, and again I think we see things through the same lens… I love winter very much, but halfway through I am ready to move on to spring! What you say about the last photo is beautiful…when doing something you love, and you believe in, the feeling can be overwhelming and nothing really bothers you as you’re in your own world. I think with you and your writing (and new novel ‘Adaora’) you can relate. Cheers! What should I say? Just stunning work. I would like to mark each picture in this collection with a LIKE. Last image really shows what it takes to get such great images, but your efforts are not wasted…. This is beautiful beyond words!!!!!!! So beautiful. And — long overdue! — I started following you via email today. I don’t want to miss any of your breathtaking posts. Thanks. Thanks Ann, appreciate your comments & views so much… I did enjoy my holiday break quite a bit. Here’s to a great ’14. What beautiful photos and words. I always shiver through the coldness of the winter, even though I am human, bundle up in clothes, hot drinks and sits next to the fireplace, so I always marvel at how wildlife has their bodies adapted to withstanding the weather. 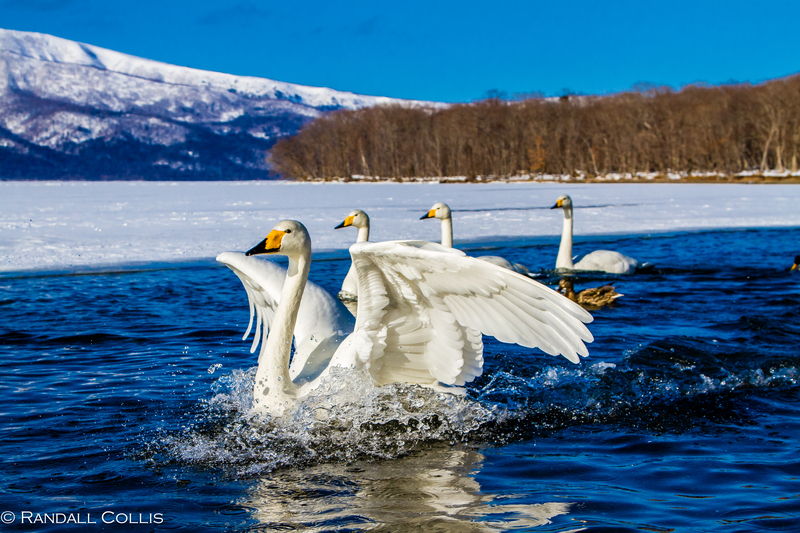 Just the thought of the birds floating on the icy water and flying around freezing temperatures is a wonder. I love how you began the post. Who is your dark haired girl? 😉 And have you had your car better down all night?.. A cup of Irish coffee sounds great, can I join in? Car battery I mean… (the corrector keeps on playing tricks on me). I understand the advantages of getting out in the winter wilderness to experience these stunning scenes (amazing pictures) but you make the beauty across my chest and the dark haired girl with the twinkling eyes so inviting. Maybe I’m better off losing myself with her than in the wilderness? Gede Prama, thank you much for your kind words. Absolutely gifted! I LOVE your work!!! I am an amateur at photography, as much as I love it, but you are the real deal! Wow!! Thank you for the wonderful words, and since we are amateurs we can enjoy getting out and when a great shot come around we appreciate it all the more. Cheers! Thank you, winter is magic…can be quiet and peaceful, perfect for your meditation. However, I am ready for a little spring sun about now. I would love to know how you take most of your pictures. Do you drive and day hike, car camp or backpack or a combination of all three? Do you just wait around for the right shot or take whatever strikes you at the moment? Am curious because your pictures are so incredibly beautiful. I am full of admiration. Thanks Malcom, while I do a little of all three, I most enjoy a hike to an area and then wait around for the shot (especially the lighting with landscapes)… a great way for me to relax. These pictures are outstanding. I can really feel the cold. 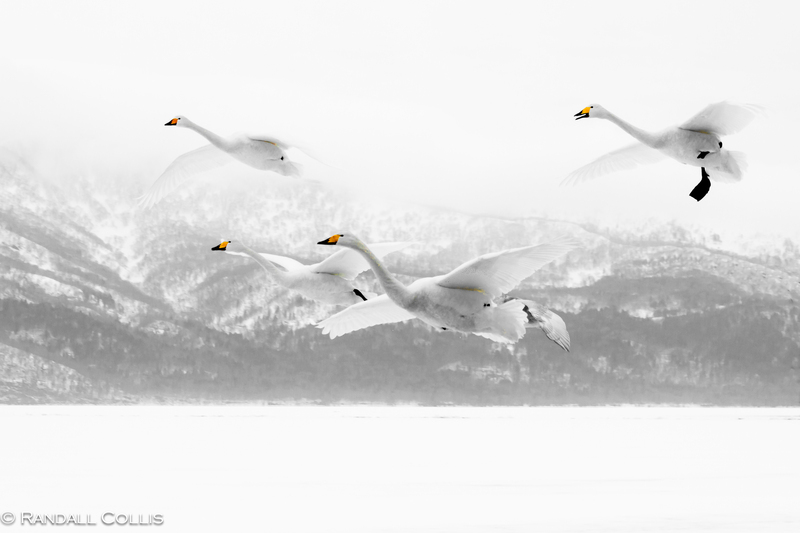 My favourites are the first one and the one with the swans in flight. Beautiful light in both of them, although very different. Thanks Otto. 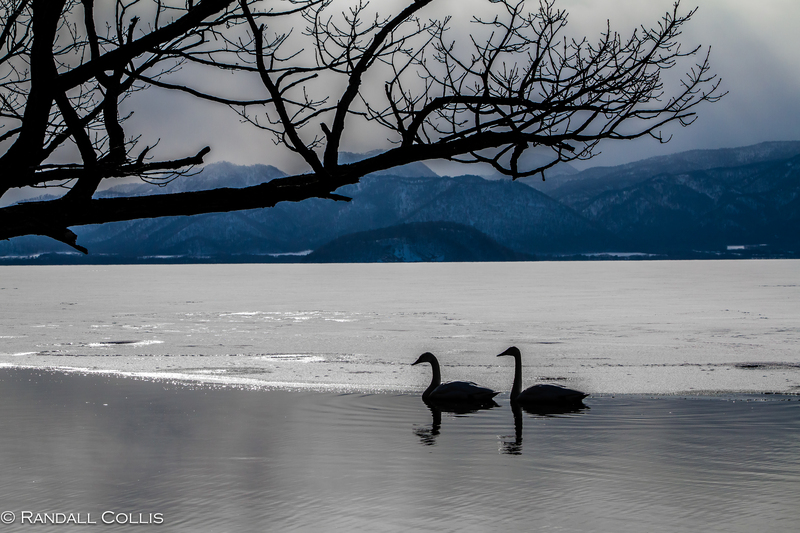 It felt good to be in the cold, as like the birds I had on my down jacket… I think that is why winter & photography appeals to me, the different lighting (and difficulties with glare/snow). Cheers! I’d have expected to see your name as author of “Winged migration”…your photography have the same visceral, strong effect. Wing Migration is one of my all-time favorites… fantastic comment 🙂 Thank you very much. Wow! How do you get to some of these locations? Are you walking on ice? I pinned the first photo on my bird board on Pinterest. http://www.pinterest.com/gaylealstrom/birds/. I hope you don’t mind. Love it, thank you very much Gayle! Simply an outstanding set of images. 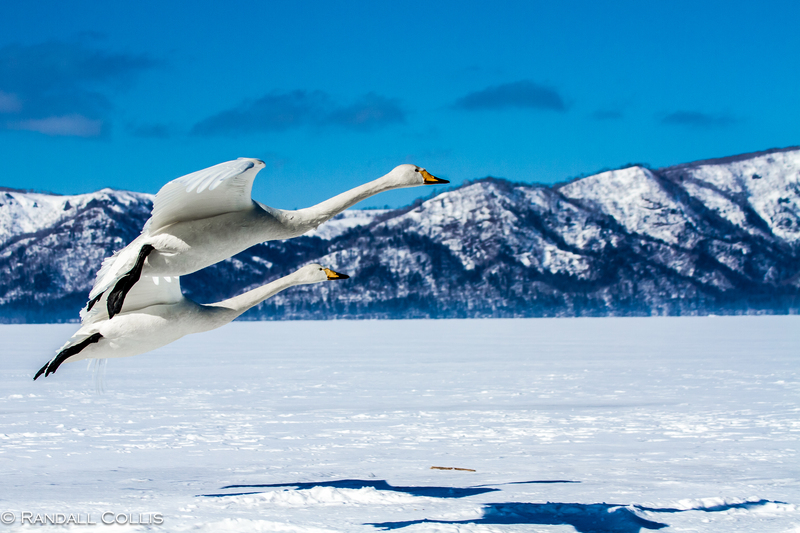 The majority of winter wildlife shots that I’ve seen from Hokkaido over the years have been of cranes, not swans, so this post has been something of a revelation. I enjoyed the commentary about winter as well. What an incredible set of images, Randall. 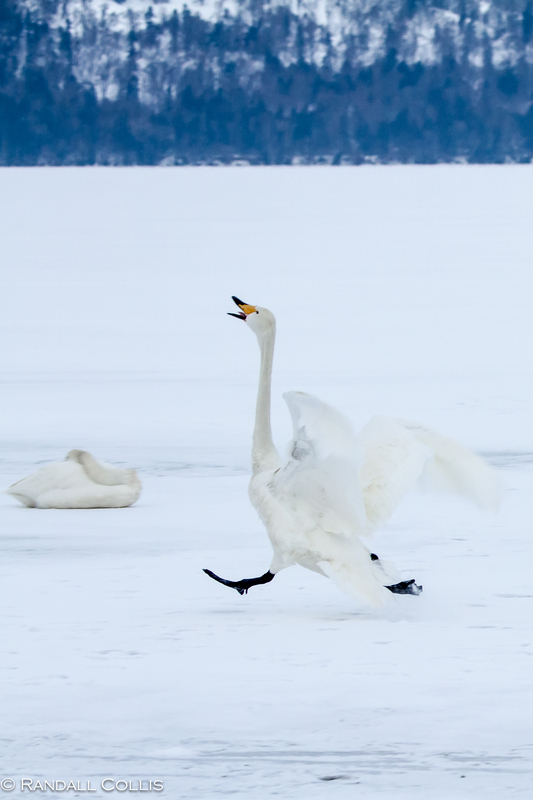 You’ve captured the swans’ energy and grace simultaneously. 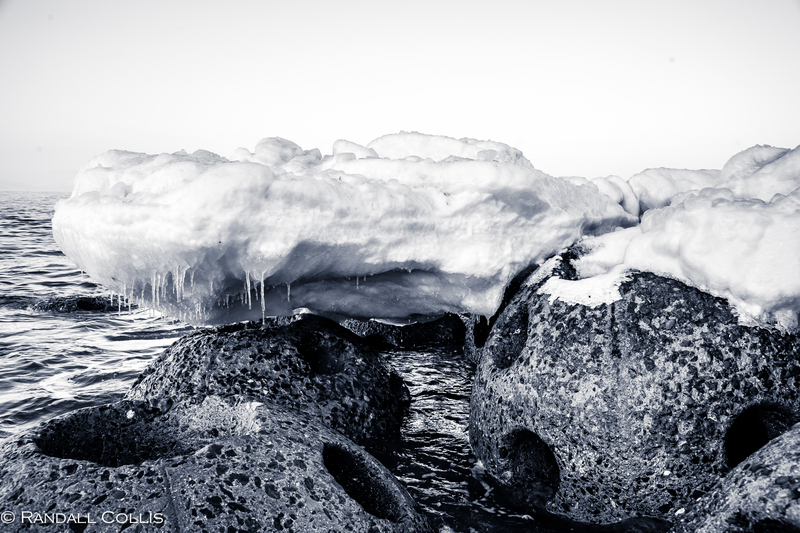 Nature’s winter beauty almost has me wanting to return to a snowy environment… but not quite. 🙂 I’m curious what kind of lens you used? Thanks Tricia. I used a Canon 70-300mm DO lens and 24-105mm. Did not have my 70-200m or 24-70 )my two favorites), but these were fun to shoot with great range. Every photograph had me in “awe”. Love your writing. I too am looking “forward to venturing out and making a watery splash to the great Year of the Horse.” It’s gonna be a great one! Thank you very much, and I think the New Year has already gotten off to a great start, just got to keep it up now. Cheers! 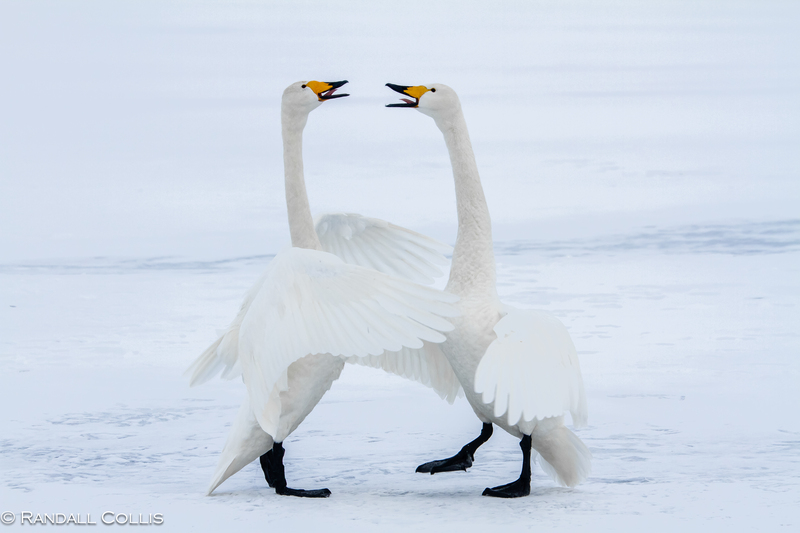 Thank you Yael, the swans dancing was such a great scene…about a 5 minute courtship dance, very cool. Fascinating! All these photographs, the grace of the intuited movement, and beauty of coloring, are touching. They bring, along with a great narrative, a sense of harmony that enables us to be at peace with oneself and the world. 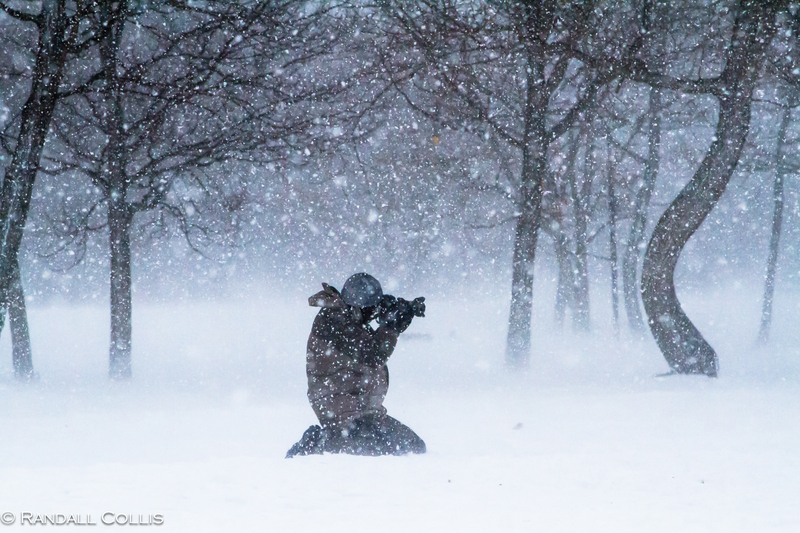 In this image-driven age, wildlife photographers carry a heavy responsibility. They can influence other people life in uncountable senses. Thank you, while pictures are worth a thousand words I always like to write a few more…hopefully without influencing the feeling any photo may bring to the viewer. I am mesmerized by your photography and your prose. You have truly found your calling in this life. And thank god, you followed it; otherwise, the rest of us would have been greatly deprived from these brief interludes with amazement! What a joy to see the world through your eyes, going places most of us will never see! Thank you for visiting my blog! I am indeed honored. WOW! All I can say is that I look forward to your posts. Absolutely beautiful! Enjoyed this shoot very much…great way to experience winter. Thank you for “Liking” the post “Alone. Not Lonely”. Streets Of Our World. on my photography blog http://www.throughharoldslens.com.